I study a lot of things and it turns out the railroad industry is a lot like the software industry. The software industry is a lot like many other industries. As an example, the rate of growth for software development is just like the rate of growth for telegraph, telephones, textiles, auto industry and the railroads. There are some obvious comparisons to the software industry. Large growt h (in the USA – 34 miles of track in 1830 to 200,000 miles of track in 1900). Largest employer during its “hay day.” Nearly 9 percent of the total workforce in 1900. Eventually outsourced work to Asian workers. Cheap labor and automation reduced the demand for rail workers. Once upon a time, the railroad industry was the world’s largest employer; and, like software jobs in the 1990s’, some of the best jobs were with the railroads. The railroad industry had similar growth to the software industry. In the 19th century Europe, the UK and the USA had rapid growth in railroads. In the USA, there were only 34 miles of railroad track in 1830; and 50 years later, in 1880, there were nearly 100,000 miles of railroad track. Over the next 20 years, from 1880 to 1900, the number of miles of railroad tracked doubled, reaching 200,000 miles. In only 70 years the railroad industry went from a dead stop to 200,000 miles of railroad track. Employment was not limited to just laying track; there was large employment in manufacturing the locomotives, passenger cars, and freight cars. In the UK, workers built 23,000 locomotives, 73,000 passenger cars, and an amazing 1.4 million freight cars in less than 50 years. This is an amazing feat when considering the tools and technologies that were available. The building of the railroads and the railcars that ran on the railroad spawned rapid employment growth in the USA and UK. The railroad industry employed about nine percent of the total workforce of Chicago. The rapid growth did not last forever. Railroad employment peaked in the 1920s, declined during the Great Depression, and rose again during World War II. Starting in the late 1940s the railroads had to compete against other forms of transportation: cars, buses, trucks and airplanes. Much of the manual labor was replaced by automation. The railroad companies improved their technology, and they started using diesel locomotives, track-laying machines, and other innovations that reduced demand for labor. Like the software industry, the railroads suffered from a lack of standardization. There was no standardized track gauge, the distance between the rails, until the 1880s. 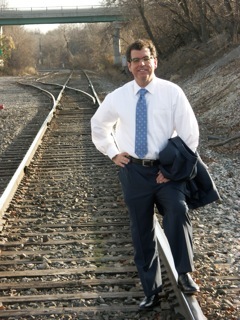 The distance between the tracks depended on who operated the rails. This lack of standardization caused a lot of problems for those individuals that wanted to ship freight or move people from one point to the next. Parts between freight cars were not standardized either. This is a similar problem faced by the software industry. There is little industry standardization for software development. In the software industry, it is common that software applications developed by the same companies do not communicate and share data. From 1920 to 1995, those employed by railroads had dropped by nearly 90 percent. In the end, it was a combination of foreigner labor, competition and automation that did the railroad workers in. In the USA, the railroads were built by cheap foreign labor especially by those coming from Asia. Software developers are facing stiff competition from India and China (Asian labor). In the 1950s Western Union, the first ecommerce company, was at the top of its game. It dominated telecommunications but failed to adapt and enter into the voice telephone systems. Employment in the telegraph industry soared in the late 1800s, but by the early 1960s, the telegraph was on its way out. It is hard to believe but the telegraph lasted until about 1991. In the end, the telegraph died of a slow death. Perhaps it died at the same rate as those who grew up with the telegraph and refused to change. There are always those who refuse to adapt. Just like those who continue to use DOS or FORTRAN, or COBOL, there are those who continued to use the telegraph-even when better options were available. The first commercial telephones started appearing in the early 1880s and by 1902, there were 2 million telephones landlines with 54,000 employed in the telephone industry. Like software development, there was a rapid growth period that was unheard of before. Twenty years later, in 1922, there were 13 million telephones and 210,000 salaried employees. Over seventy percent of those employed by telephone companies were operators. It was better tools, techniques, and automation that replaced the telephone operator. Employment in the telephone industry grew until it peaked in 1979 with slightly more than 1 million employees. Since 1979, the number of people employed by landline telephone companies had fallen to about 300,000 in 2006. Today, everyone understands cell phones will replace landlines, and I am sure there are some who will hold onto their landlines until they die. The common thread in all these industries is a belief that the growth is going to last forever. I am not sure where we are on the growth curve for software development, but I do know the industry will peak and then rapidly decline. The software industry will continue to change rapidly and automate impacting those employed in the industry . If, in 1915, someone would have suggested to the million plus blacksmiths employed in the industrialized economies they would be obsolete in less than 50 years, they would have thought that person crazy. The idea of working with metals, fabricating metals, did not evaporate; it was the role of blacksmith that became obsolete. The role of blacksmithing turned into ironworkers, and those blacksmiths that did not learn the new skills of ironworkers were not able to find employment. As software development rolls down the road of progress, the programmer will become obsolete; and the idea of software developer will continue into the future. I imagine there are those reading proclaiming, “You will always need someone writing code,” and I am sure there were those blacksmiths who could not imagine a world without them, either. It will be a combination of automation and outsourcing that will make the Western programmer obsolete. Not long ago everyone was talking about the new economy and the news media had several stories about the “new economy.” It turns out the new economy is just like the old economy, and the ole economic laws still apply. The software industry is experiencing a lot of growing pains experienced by other industries. Since the first computer language appeared in the 1950s there has been a churn, of both hardware and software. Hardware companies like Wang, Control Data, and Digital have come and gone and were replaced by Microsoft, Dell and Apple. Software languages have come and gone, too. Assembler, Fortran, and COBOL have been replaced with Java, Java Script, and C++. Long before there was Word, there was WordStar and WordPerfect; and, before Excel there was VisiCalc and Lotus. Whatever happened to Lotus 1-2-3? Mark Twain once quipped, “History may not repeat itself, but it does rhyme a lot.” These days, software development rhymes a lot with other industries. I hear from software developers that the software industry is unique, and no other industry has experienced the same type of growth that software development has experienced. If we look back in history, then we understand that several other industries have experienced rapid growth rates similar to the software industry. The growth curves for the railroads, telegraph, telephones, textiles, and the auto industry all have the same shape. There is rapid growth, the industry peaks, and employment falls off. Some industries, like the telegraph, just disappeared. I am not suggesting that the software industry is exactly like every other industry because there are similarities and differences. What I am suggesting is that by looking at other industries, we can get an understanding of the future of the software industry. What I am suggesting is that the software industry does rhyme a lot with other industries. While I started out in Assembler, I was always fond of Fortran. Fortran first appears as a useful programming language in 1966 and received major upgrades by 1977. Believe it or not there was a new release of Fortran in 2003 and another release planned for 2008.